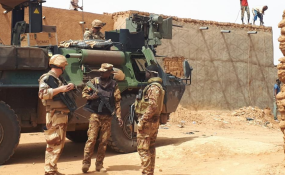 Mixed patrol in Mali (file photo). Bamako — THERE is outrage following the killing of children, who among more than 130 people murdered in a terror attack in central Mali. The deadly attack occurred at a village in the unstable Mopti town this past weekend. Many of the injured children have been evacuated to health facilities for treatment. United Nations Children's Fund (UNICEF) said it was saddened and outraged that children were among the casualties. "Children are paying the highest price for the intensifying violence in central Mali," a spokesperson stated. The UN agency bemoaned that since 2017, rising insecurity had led to an increase in the killing, maiming and recruitment of children into the ranks of rebel groups. Children are increasingly deprived of education and essential health care as violence leads to closure of schools and compromises access to health centres. UNICEF urged all parties to the Mali conflict to immediately end the violence and shield children from harm. "Children's right to protection from all forms of violence should be upheld at all times," the agency stated. This is arguably the worst attack in the Mopti area this year. More than 30 people were killed in another incident in January. Such onslaughts have continued despite the deployment of the UN mission (MINUSMA) in 2013. The mission is easily the UN's most dangerous peacekeeping contingent, with 150 peacekeepers killed out of a force of about 11 000 troops.